Change the screen resolution. 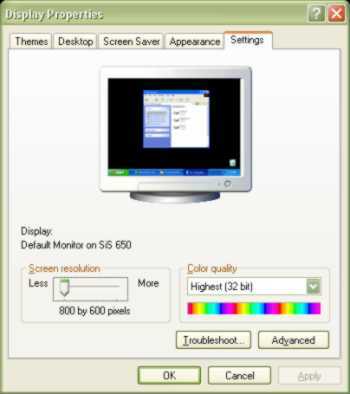 As computer screens come in many different sizes, each user can adjust how many pixels (dots per inch) are displayed., Older, smaller screens (14") were commonly set to 640x480 (640 pixels across and 480 pixels down). Now with the advent of modern screens, people with large screens (17" +) can set their resolution up to 1600x1200. There are several ways of getting to this program. ... menu, choose Settings, Control Panel. Once in the control panel, double click on Display, then Settings. Point to the Screen Area marker, slide it to the right. The limit to size is dependent on what kind of display adapter your computer has. Use the Color setting drop down list to choose any of the available choices. Click on the OK or Apply button. Depending on how the system is set up will determine whether the computer will restart or just apply the changes. Wave your mouse over the image to see the Windows 98 display settings window. There are a great many games still available that require a 256 color setting, for this reason it might be an idea to add the display settings to the task bar by choosing the Advance button.